Evelyn King’s origin story as a profession singer is one that you seldom hear any more. She was discovered on a TV show and (obviously) through a a YouTube video. Another Philly native,King was discovered singing Sam Cooke’s “A Change Is Gonna Come” while working as an office cleaner for her mother at Philledelphia International Records. Her future producer T (Theodore) Life overheard the teenager’s husky and rangy voice and began coaching her. In 1977 he signed up as her producer on at MCA records where she recorded her debut album Smooth Talk and it’s massive disco smash hit “Shame”. One thing about King’s career arc is how much her strong,soulful voice was developed in terms of quality albums as well as singles. This is something usually done with instrumentalists,whereas singers are generally expected to churn out successful single records. In 1981 her music began moving in the boogie/post disco direction under the guidance of her new producer Kashif. In 1983,she moved onto Minneapolis Prince alumni Andre’ Cymone along with Leon and Foster Sylvers. This 1983 albume Face To Face contains one of my favorite grooves from King during era in “Shakedown”. Phat orchestral synthesizers playing along with a snare sound heavy drum machine begins the song. After this,the drum machines goes naked with only live percussion providing some instrument undergarments-along with bursts of slap bass. Then the brittle synth brass comes in-eventually accentuating bluesy vocal lines on the refrains. This pattern continues throughout the song-with the choral bridge being sung over the more orchestral intro. On the bridge,Shalamar guitarist Miki Free provides scintillating layers of rocking lead guitar before the drum/bass/percussion based refrain fades out the song. As a vocalist whose career generally celebrated quality album runs,Evelyn King also made funk as much a part of her sound as the disco-dance records she made. And her funk numbers have really served her well creatively and commercially as an uptempo based artist. This one has really grown with me because it’s a great combination of boogie’s live bass and percussion with a Minneapolis style synth brass/drum machine powered groove. This type of sound would evolve into what Jody Watley did on “Looking For A New Love”-also produced by Andre’ Cymone. So on that level,this funk is a pretty big deal. Michael Jackson was likely the first artist who ever focused my attention on instrumentalists. While admiring the vocal,songwriting and performance ability of the Jackson brothers in general? My attention would focus on the liner notes of their albums. This came after watching The Jackson’s-An American Dream mini series on TV. And my parents loaning me their Michael Jackson/Jackson related albums. I personally wanted to know more about the musicians whose sound made the rhythms snap,crackle and pop with funkiness and soul the way they did. It has gone on to be a tremendous learning experience for me. Two of these musicians that I noticed on the liner notes to Mike’s iconic Off The Wall album,from my mom and dad’s original vinyl copy,were guitarist George Johnson and his bassist brother Louis. Considering my interest in bass players even then? It was amazing to learn just what a bass icon Louis Johnson in particular was. Not to mention his enormous debt to the 1980’s by his iconic electric bass line on Mike’s “Billie Jean”. While I knew who Quincy Jones was of course? I had no idea of the breadth and scope of his musical outreach until learning more about the Brothers Johnson. A few years later during mid adolescence? I was browsing the CD racks at the now defunct Borders Books & Music. I noticed a collection of four newly arrived releases by…The Brothers Johnson. The earliest one, 1976 album called Look Out For #1 showed a photographically powerful image,take from below,of two super hip looking young musicians playing bass and guitar and singing with enormously enthusiastic expressions and stances. All of these album covers projected intensity. Album art is just art of course. But the best part was,as I veered toward adulthood, was discovering that these albums were musically just as energetically funkified as their cover art implied. During my early 20’s? Something began to become uppermost in my understanding of the Johnson brothers musicality. Free jazz/bluesgrass/rock guitarist and writer for Allmusic.com Eugene Chadbourne perhaps worded it best about the revelation I had-when Mister Chadborne described the Johnson’s as coming from a period where musicians in the jazz/funk/soul genre were judged by the dues they paid in professional situations. As opposed to being judged by a romantic notion of street credibility. Since that latter notion totally defined the local understanding of musical appreciation around me at that time? This led me to more research,both through physical literature and my earliest experiences online, about the Johnson’s and other funk era instrumentalists. By the time 2004 rolled around? And I was connecting with a group of local musicians/DJ’s as something of a local funk bands volunteer videographer? It was the story arc of how musicians such as George and Louis Johnson became musical icons that was fascinating me most. The brothers started playing with the Billy Preston band while still in high school. Quincy Jones then became taken with the duos talents. And he bought them in to record with his mid 70’s band on his 1975 release Mellow Madness-much of which qualifies as the earliest introduction of the Johnson’s duel playing and vocal harmonies. And the rest was history. In addition to success as a duo with their own albums? They would go from blistering session work with Herbie Hancock and George Duke to 80’s era work with Leon Sylvers and Slave’s Steve Arrington. Looking back on it all now? 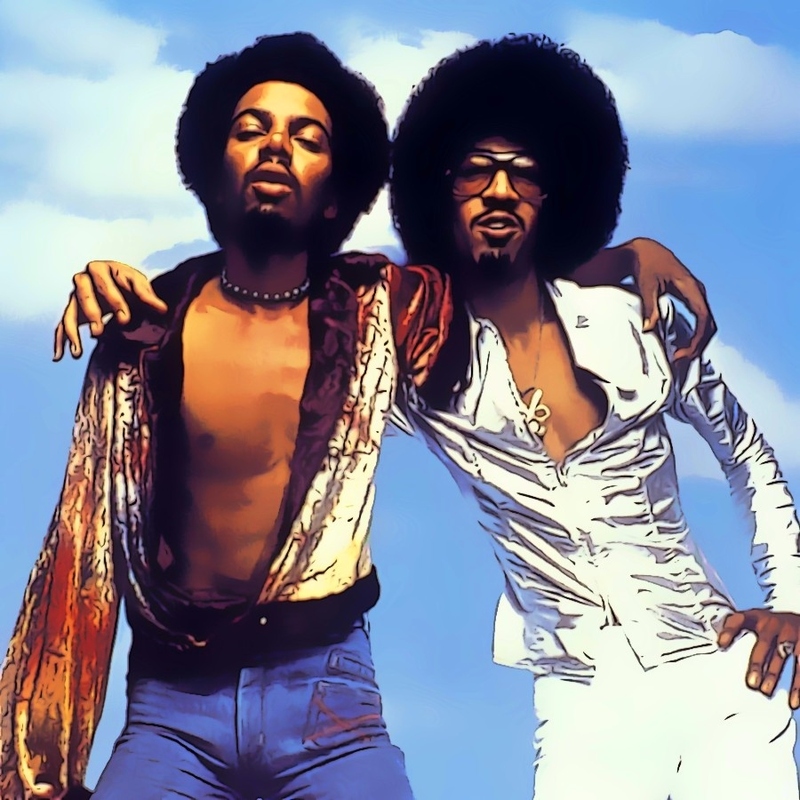 The Brothers Johnson are the main reason why I have continued to focus so heavily on the instrumentalists relationship in the creation of the funk,soul and jazz music that has become such a source of creative and emotional inspiration for me. Getting back to the Michael Jackson angle? Now that the man sadly isn’t with us anymore? Whenever I hear his first two Quincy Jones produced solo records? It’s a lot more easy to tune into how Mike’s vocal hiccups take their turns popping right along with George and Louis’s instrumental licks on songs such as “Get On The Floor”,”Burn This Disco Out”,”Baby Be Mine” or the aforementioned “Billie Jean”. So among all the wonderful funky soul the Johnson’s have made? What I’d personally thank them for is helping increase my level of understanding of why playing in the groove works in music.